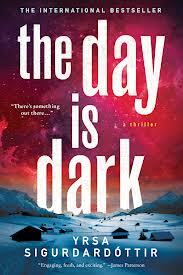 The Icelandic author with a large international following brings the next installment of her series featuring lawyer and sleuth Thora Gudmundsdottir in this translation of The Day Is Dark. Divorced with two children and a surprise grandchild, Thora is involved in relationship with banker Matthew, which leads to her involvement in accompanying him to the remote east coast of Greenland. Looking for a change from her usual cases at her Icelandic law firm, Thora is intrigued with the idea of helping the bank establish why work has stopped at a mining operation. The few days away with Matthew and hint of romance she longs for will not materialize once they arrive at the harsh reality of the mining site. Two workers have disappeared, which is the reason workers have given for leaving the site and refusing to return, halting all work in the unforgiving, wild area, where snow and cold are unlike any Thora has known. She soon finds an additional disappearance of a woman from the site occurred several months prior, which adds to the mystery of what exactly has happened at the remote site. The icy, wintry landscape provides an unsettling atmosphere for the investigation of the team sent with Thora, her assistant Bella, and Matthew. This team include two members from the previous worker group who are familiar with the site and its functioning, plus a physician in case the missing men are found alive but injured. Then bones are found in random desk drawers and the dread ratchets up. Damage to the compounds satellite leaves the team with little contact with the outside world. Concerned the missing people may have succumbed to a disease, the doctor rations their food and water, adding to the team’s discomfort. Trying to get information from the few locals in the nearest town proves almost fruitless. With the depressed economy and a high incidence of alcohol abuse, most townspeople are superstitious and believe the area of the mine is cursed. The one person who will speak to Thora warns her to return to Iceland. And then she finds herself outside, alone, when a figure appears out of the shadows. There are plenty of creepy happenings in this cold and unforgiving setting which add to the unease and tension, even as readers learn about age-old differences in the culture. The slow parsing out of new information annoys Thora as much as their restricted food, uncomfortable shelter, and lack of knowledge with local history which pervades the mystery. Past recriminations play a factor, as will long-held ideas about the land and its spirits and family secrets. Sigurdardottir writes a complex puzzle of a mystery while giving outsiders a glimpse far removed from their comfort zones.